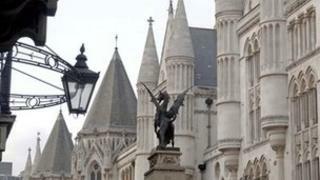 The High Court has ruled the Roman Catholic Church can be held liable for the wrongdoings of its priests. Mr Justice MacDuff gave a decision in favour of a woman, who claims she was sexually assaulted as a child by a priest of the Portsmouth Diocese. The woman, now aged 47, alleges she was abused by the late Father Wilfred Baldwin at a Hampshire children's home. The judge said the Portsmouth Diocese "may be vicariously liable" for Father Baldwin's alleged wrongdoings. Lawyers for the claimant said it was the first time a court had been asked to rule on whether the "relationship between a Catholic priest and his bishop is akin to an employment relationship". The NSPCC has welcomed the ruling and said it will look closely at the wider implications. Jon Brown, from the children's charity, said: "All organisations that work with children have a clear responsibility to ensure their safety. Religious organisations are no different. "This is a ruling in favour of children and rightly places the responsibility on the Church to ensure that they select and monitor priests carefully and have robust procedures in place to take steps to protect children when there are concerns." The Church had claimed it could not be held vicariously responsible because there was no formal employment relationship with its priests. But Mr Justice Macduff decided the professional relationship between a priest and his bishop was sufficiently close so as to impose responsibility. The woman claims she was sexually abused and raped by Father Baldwin, who died in 2006, when she was resident at the home in the 1970s. Lord Faulks QC, for the defendants, said the Catholic Church "takes sexual abuse extremely seriously and it is entirely concerned to eradicate it". The hearing to determine the Church's responsibility took place in July, but judgment was withheld. The trustees of the Portsmouth Roman Catholic Diocesan Trust were given leave to appeal. A statement issued by the Roman Catholic Diocese of Portsmouth said: "The diocese is committed to creating a safe environment for all. "By adopting the Catholic Church's national safeguarding policies and procedures, and through its safeguarding commission, the Diocese of Portsmouth works hard to ensure the welfare of children and vulnerable individuals within the diocese. "In the circumstances, the Diocese of Portsmouth does not consider it appropriate to make any further comment about the case at this time."